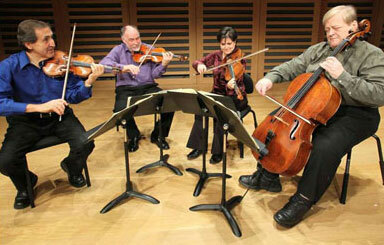 At our inaugural event on 24th October 2011, the Chilingirian Quartet played the Ravel String Quartet in F major and Mozart’s String Quartet no 18 in A major, K464 and, as a bonus following prolonged applause, the minuet and trio from another Mozart quartet, K449. The subsequent reception in the foyer of The Dome, opened by Andrew Comben, chief executive of The Dome and Brighton Festival and then addressed by Mary McKean, chair of Strings Attached, marked both the launch of STRINGS ATTACHED and the 40th anniversary of the Quartet. Over 200 of us attended the beautiful performances (with many commenting on the effectiveness of the acoustic qualities of the Corn Exchange when set ‘in the round’), enjoyed the convivial conversation with fellow chamber music lovers and the performers, and were treated to a glass of wine and tasty canapes. Strings Attached signed up yet more new members and looks forward to a healthy and useful life! 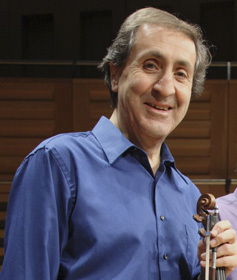 The distinguished violinist and famous quartet leader Levon Chilingirian, OBE is our president. His quartet played for the STRINGS ATTACHED inaugural concert on 24th October 2011, he is immensely encouraging in his support and has particularly asked to be kept in close touch with our progress.